Albert James Freed was born on December 15, 1921 in Windber, Pennsylvania. The world would never be the same. 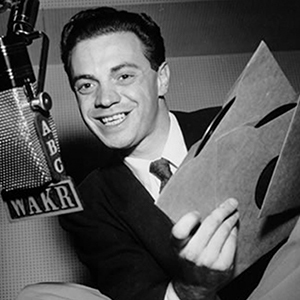 In 1945, Freed–now Alan- went on air at WAKR Akron, where he cut his teeth playing jazz and pop records. It was during his WAKR years that Freed met Leo Mintz, owner of Record Rendezvous, one of Cleveland’s largest record stores. Mintz shared with Freed something he’d noticed: an increased interest in the rhythm and blues records he’d recently started selling. And the rest, as they say, is history. Via Freed, listeners were introduced to the very phrase “rock and roll,” and it’s no accident that the Rock and Roll hall of fame makes its home in northeastern Ohio. In the decades since Alan Freed took to the air with Bill Haley & His Comets, The Platters, Chuck Berry, Little Richard, Jerry Lee Lewis, and countless other legends, an immeasurable audio tapestry of radio hits has been woven. And, it’s in the heat of the summer, with the windows down, those beats have resonated the most. Summer hits have a way of either defining their era, serving as an escape from it, or standing completely on their own for decades to come. 2018 has served up a banquet of faves, from Cardi B, to Drake, to Kacey Musgraves. And there’s of course a gift from Taylor Swift (and Sugarland), “Babe.” And while we’re on the superstars subject, Justin Bieber serves up “No Brainer,” via DJ Khaled. Post Malone continues to prove unstoppable, this time with “Better Now.” And truly, what summer (or season, really) would be complete without some wisdom from Kanye? “Ghost Town “delivers. This year, as ever, the songs of summer serve as a veritable audio snapshot of where we are a culture, how we seek to relax and celebrate. A thermometer reading of why, when, and how we chill. There are the obvious shoo ins, destined for greatness by hook and title: “Summertime” (1991), DJ Jazzy Jeff and the Fresh Prince; “Summer in the City” (1966), Lovin’ Spoonful”; “Summertime” (1957) Ella Fitzgerald and Louis Armstrong; “The Boys of Summer”(1984), Don Henley, “Dancing in the Street” (1964), Martha and the Vandellas. And there are the endearing, lasting novelties: “Wipe Out” (1963), The Surfaris, “Drop it Like It’s Hot (2004) Snoop Dogg, featuring Pharrell; “Baby Got Back”(1992), Sir Mix-A-Lot; “Ghostbusters” (1984), Ray Parker Jr; “Macarena” (1996), Los Del Rio. Sandwiched in, though, are those songs that we may not associate with convertibles and daisy dukes, but that were forever burned our brains and our cultural consciousness from the moment they greeted our ears: “Every Breath You Take” (1983), The Police; “(I Can’t Get No) Satisfaction” (1965) The Rolling Stones; “When Doves Cry” (1984), Prince; “Waterfalls” (1995), TLC; “Shout” (1985), Tears for Fears. There’s just about a month left of summer…so, get out there and roll those windows down, and turn the music up!